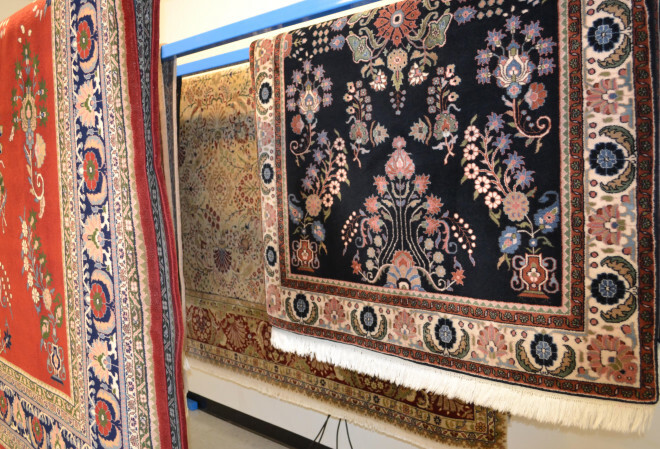 At Oriental Rug Salon, we understand that your delicate fabrics are an expensive investment that, unlike regular carpets and upholstery, can last up to 150 years or more with proper care and attention. That’s why we ensure your rugs are carefully treated only by our certified, trained specialists in our unique plant using a process combining Old World craftsmanship, new technology, and powerful yet gentle cleaning solutions that are environmentally responsible, allergen-free and safe for small children and pets. Your Oriental, wool, silk and other area rugs are not just art treasures. They are also very valuable investments or family heirlooms. That’s why we clean them with so much care and attention to detail. The recommended method for cleaning natural fiber rugs is a full-immersion wet bath designed to remove dirt, sand, bacteria, pet dander and other contaminants that are lurking deep within the rugs fibers. 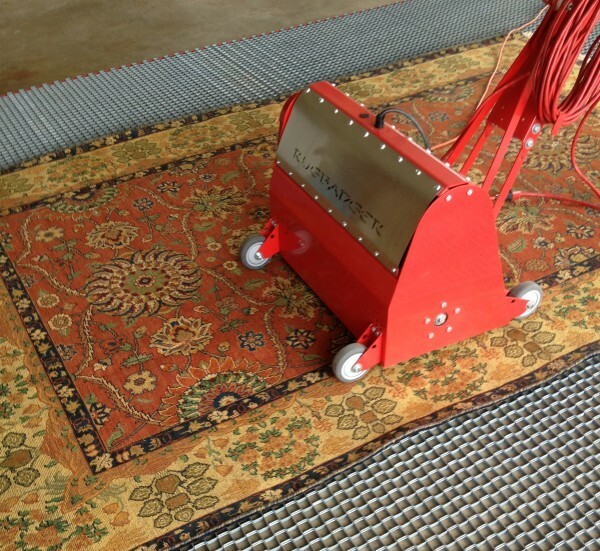 Our craftsmen do not use production line automated pieces of equipment to clean delicate area rugs. For thousands of years wool and silk rugs have been washed by hand with the love and attention they require. In fact, in Persia and other parts of the world, wool and silk rugs are still washed in rivers and laid out to dry. Each rug is washed by hand and one at a time. Due to the unique construction, fiber type, dye chemistry and condition of the rug, our experts will develop a unique plan to make sure that your textile receives the most thorough cleaning possible. Rugs properly cared for will last many generations and in-fact we regularly clean antique rugs that are more than 100 years old. Each rug is inspected using Xenon lighting for any pre-existing conditions. 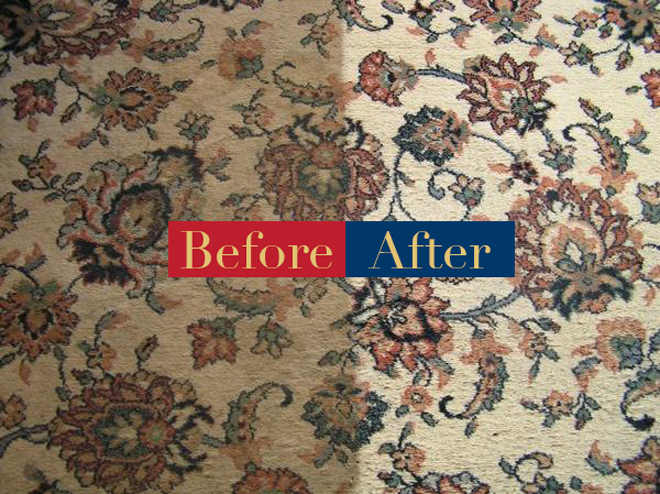 Many times, soil covers up dye variations, fiber staining, prior dye bleeding, worn areas or white knots that become “uncovered” after the wash.
Our pre-was inspection will also detail any fringe issues, pet urine or insect damage as well as any other concerns we may have. We will photograph the rug and discuss with you our findings before moving to step 2. If you bring your rug to our shop we will perform the inspection with you present. 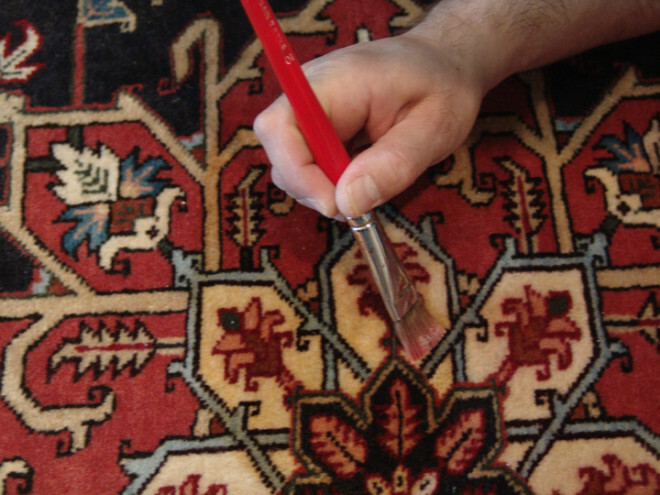 If we pick up your rug, our technicians will perform the per-wash inspection and call you with their findings. We can also e-mail pictures of our findings if necessary. 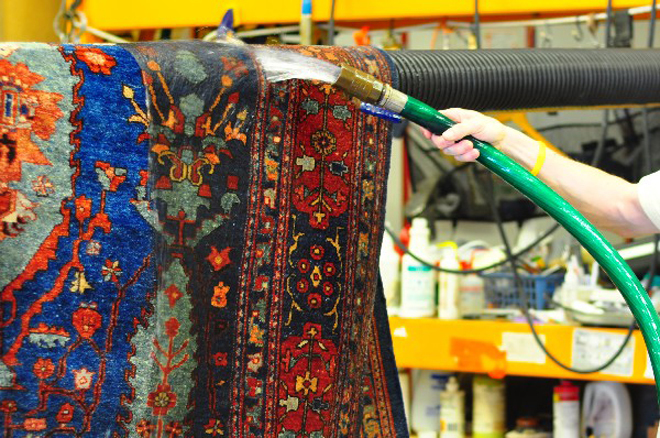 A prudent first step when a rug comes into our rug washing plant is to perform a dye test before getting the rug wet. 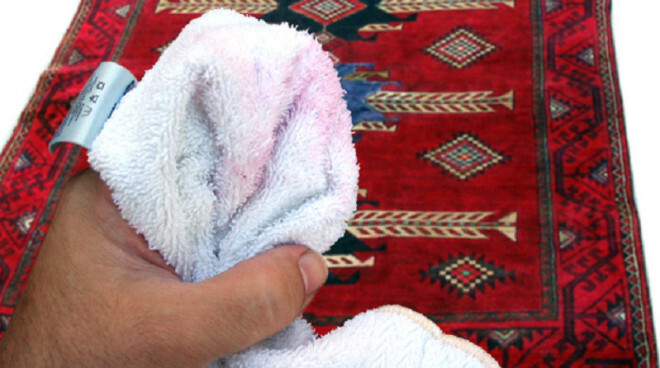 In certain situations a client’s rug may bleed due to conditions such as fugitive dyes, excess dye application when the rug was made, if the rug has been exposed to high heat or alkalinity by either the rugs owner or a carpet cleaner, pet urine issues or past in-home rug cleanings (Rug Doctor, personal rug cleaning machine, etc.). Without thorough testing there is no way to plan and prepare for safely washing a rug. In the event our test reveals a rug will “bleed” our craftsmen will make a determination as to the best way to clean the rug and we will convey our findings to the client. Once the pre-wash inspection and dye test is complete, the next step is a thorough vacuuming and dusting of the rug. Wool fibers under the microscope look like fish scales that can hide dirt, grit, pet dander, dust mites, soil and other contaminants. A wool rug can hold POUNDS of soil in its fibers before beginning to look dirty. So prior flooding a rug with pounds of dirt, dander and other contaminants that can turn to mud, we thoroughly vacuum both sides of the rug and then use a specialized dusting machine. Our dusting machine applies over 40,000 harmonic waves through the rug thereby dislodging the dirt not only from the rug’s fibers but from the foundation warps and wefts as well. This thorough “dusting” allows us to remove years of deep-set soil and other contaminants left behind by the owners’ vacuum cleaner. At the conclusion of the dusting process, all spots are treated with specialty spotting solutions to help loosen them prior to the washing process. 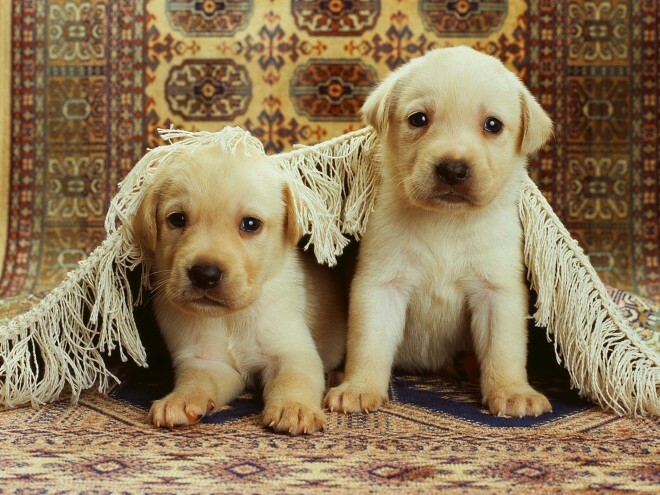 Many of our clients have beloved pets that periodically wreak havoc on their fine area rugs. When this occurs, you can rest assured that we are well equipped to handle the issue. Treating pet contaminated rugs takes expertise, patience, and the appropriate cleaning agents or enzymes to safely eliminate the pet issues while protecting the integrity of the rug. When rugs have pet urine issues, our technicians will isolate the rug, apply live enzymes to the contaminated areas and allow the treatment to dwell for a minimum of 24 hours. This isolation process guarantees complete decontamination of any urine, feces and vomits and prepares the rug for the cleaning process. Our pet urine and odor treatment processes are so thorough we guarantee the odor will be gone and the rug will be decontaminated. This is very important as pets – especially cats – have very strong senses. If they can smell any residual urine, they are much more prone to returning to that same spot again and again. We can effectively treat most rugs for urine decontamination. If we feel a rug is beyond salvaging, we will tell you. 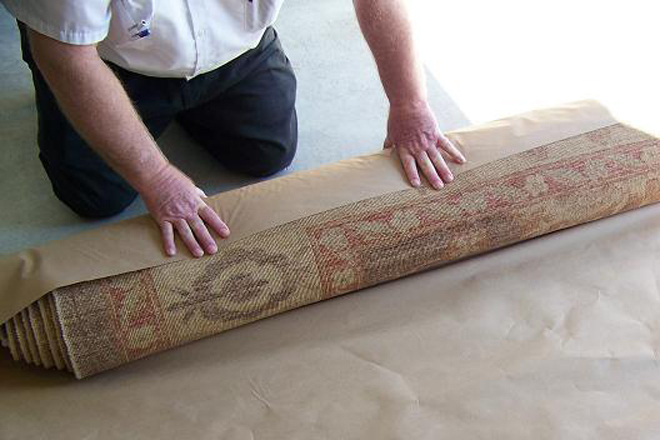 To determine this, our Oriental rug care specialists will need to inspect the rug in person. In almost every instance clients rugs are bathed using the full submersion hand-wash process. We fill up a large rug bath with the appropriate cleaning solutions specific to your textile and both sides of the rug are washed using a horsehair brush. This hands-on approach to cleaning allows our technicians the opportunity to “touch” every inch of your treasured heirloom while delivering personal attention and the deepest clean possible. The rug is washed using mild rug shampoo and cool water just like you would with your wool or cotton sweater. We avoid hot water, harsh detergents, and high heat. Once your rug has been thoroughly cleaned it is then rinsed to remove all of the soils and cleaning agents. It may surprise you to know that Oriental Rug Salon’s rinsing process is so thorough that our final rinse water is actually clean enough to drink! Caution! We do not recommend you try this with any other company’s rinse water! Depending on the age and structural composition of each rug, we will either hang them to dry or lay them flat on an elevated drying bed. Air movers are used to help facilitate drying, and dehumidifiers help control the drying environment. By not using hot water during washing or high heat in drying, you avoid the worry of shrinking. I can’t tell you how many times we’ve heard complaints from new clients that their area rug shrunk or twisted when they let a carpet cleaner “clean” their treasured rug. Wool and silk fibers are similar to quality wool and cotton fabrics, so a gentle wash and “dry out flat” is how they have been washed for ages. But, as with your brand new clothing items, there may be a very slight shrinking for its very first cleaning of perhaps an inch, but after the first wash that is no longer a concern (unless of course the rug is improperly cleaned with high heat carpet cleaning machines in your home, which can shrink, misshapen, bleed, and harm your rugs) You should NEVER allow your rugs to be cleaned in your home by a carpet cleaning company. Fringe on a hand-made Oriental, wool or silk rug is actually the extension of the rugs “warps” and in most instances are made of cotton. On machine made rugs the fringe is usually sewn on to the rug. Since most fringe is white, it shows dirt easily and when the fringe appears dull and dirty the looks of your beautiful area rug is diminished. During the cleaning process, fringe tassels are scrubbed and treated with a specialty fringe cleaner. Cotton fringe is an absorbent fiber and is difficult to clean (think of your kid’s shoelaces) but with the right amount of attention and elbow grease, we can make your fringe look practically brand new again. Once the fringe has been cleaned and dried we give them a final going over with a horsehair brush and prepare the rug for final inspection. When the wool fiber is sheared from the animal, the natural protection is no longer produced, subjecting it to faster deterioration (wear) and permanent staining. To help protect your freshly cleaned rug from spills, sun fading and wear we recommend an application of fiber protection. With proper care and protection Oriental, wool and silk area rugs will last for generations. An application of stain protector is one of the best ways to extend the life and beauty of our cherished rugs. After a day at the salon, the rug is now ready for final inspection. The owner of the company personally inspects each rug to make sure the quality of the cleaning and/or repair meets our high standards. After the rug has been allowed to dry the surface of the rug is then conditioned with a specialty application of conditioning agents. The solution is worked into the rug and then tamped to dry. Once the rug has been conditioned and allowed to air dry we inspect using Xenon lighting to make certain no bacteria or urine salts are present. We then check the rug with a moisture meter to make certain the surface, foundation; warps and wefts of the rug are 100% dry. The rug is then visually inspected along with any fringe and the surface of the rug is then tested with a silk cloth to grade for softness and deodorization. The final step is to prepare the client’s area rug for delivery or storage in our indoor controlled environment. We LOVE rugs and our attention to detail and care is apparent in every rug we clean or repair. Whether you have an investment textile or a rug you fell in love with for your home or office, we care for your rugs just like our own. For more information on our rug cleaning or repair process please feel free to give us a call at any time.